Kelsa L. Hovelson is a native of Minnesota, where she grew up in a small, southeastern town. She obtained her Bachelor of Science degree in Nutrition and Fitness from Colorado State University in Fort Collins, completed a dietetic internship in Boston, and became a Registered Dietitian (RD) in 2009. For 5 years, she spent time working as an RD in Colorado and Minnesota in a variety of clinical settings. Desiring to increase her clinical knowledge in order to provide a higher level of care, she decided to go back to school. 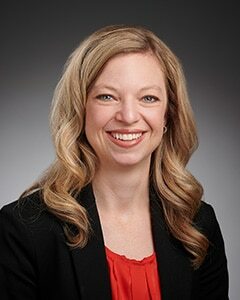 In 2017, she completed her Master of Physician Assistant Studies degree through Bethel University and joined Ear, Nose & Throat Specialty Care of Minnesota in 2018. Kelsa will continue to share her nutrition expertise in her PA-C career. When not working, Kelsa values spending time with friends and family, especially her nieces and nephews. She is very active and enjoys most anything outdoors. When given the chance, she enjoys traveling and experiencing all that Minnesota has to offer!